A majority of SHTF scenarios hit a bottleneck with mobility. The bug-in crowd solves it by staying put. The bug out vehicle crowd will just drive over the huddled masses. And the lone wolves will run for the hills scoping nightscape through a rifle-mounted thermal imager. For the rest of us, we need realistic gear solutions that address actual needs, and have a proven track record of performance. And we also need authentic solutions to move our gear. 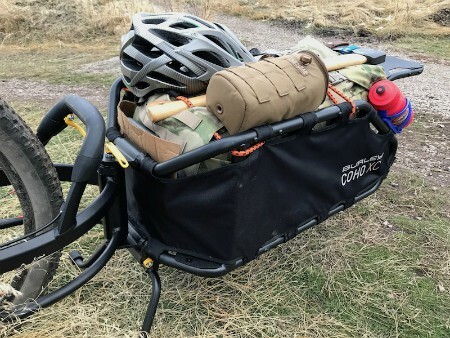 The Burley COHO XC Bike Trailer is a serious piece of hardware what scores at the top of its class across all categories whether for recreation, lifestyle or TEOTWAWKI. Bicycles are the most efficient form of mechanized transport and can easily carry a human and gear over a hundred miles in a single day powered by nothing but bananas. Rolling along a flat road at easily over five times faster than a normal walking pace, the bicycle excels as a bug out vehicle. 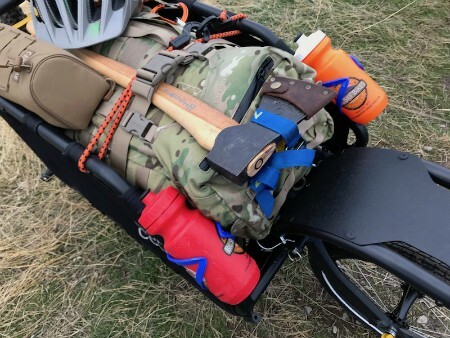 Add some cargo to the rolling equation and the mobility options presented by a bike and trailer can easily rival any other bug out vehicle. With a suggested capacity of 70 pounds, the Burley COHO XC can quickly exceed the gear hucking of even a Recon Marine. And that’s while still maintaining that 12-15 mile per hour pace! 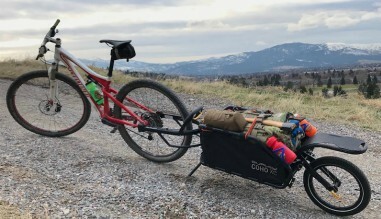 There is a strong overlap between backpacking and bugging out And there is a significant overlap between the bug out trailer and a popular outdoor activity called “bikepacking.” the difference between bikepacking and traditional bicycling touring is that bikepacking uses the bike to carry the load whether riding the bike or not. Preferably the former. Bikepacking is like touring as road tripping is like overlanding. There is just something so different about piling on the gear and heading out anywhere, especially off road. 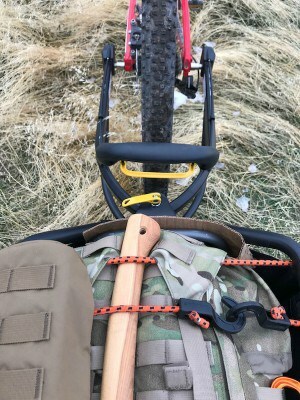 And moving your heavy gear to a trailer has many serious advantages including an overall lower center of gravity, the ability to carry large single gear pieces such as a backpack, the advantage of ditching off your gear in one quick motion like unsnapping and dropping your backpack, centralizing your gear to maintain the frontend handling of your bike as it was designed, and especially increasing your overall gear-carry capacity. 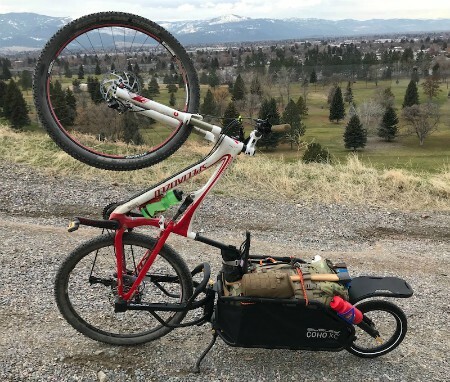 The bike and trailer combination can move near silently on and off road, and stop on a dime, turn on a quarter, and quickly be disassembled for portage over rock, water, and obstacle. The entire system can disappear into a bush, be hidden in a lake, or buried under dirt and leaves. It requires no gas, no oil and no electricity, and will run to the point of failure without a single complaint. The only real drawback is that you are the engine so your health and fitness is what keeps the bike and trailer system alive. The serious single-wheel bike trailer was popularized by an early adopter called the B.O.B. Trailer. It’s heavy metal frame, complex yoke attachment, and low ground clearance opened the door for innovation. 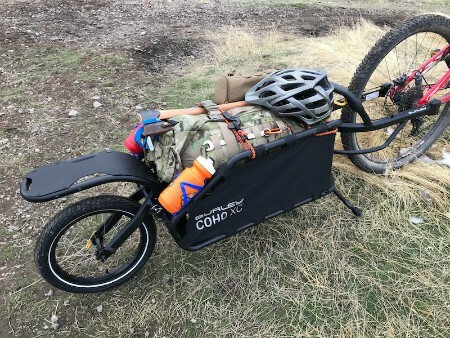 Other companies joined the quest for the perfect single-wheel trailer including the original B.O.B company, but until the Burley COHO XC arrived on the scene, all bug out options were a compromise given just how good a single-wheel bug out bike trailer could be. 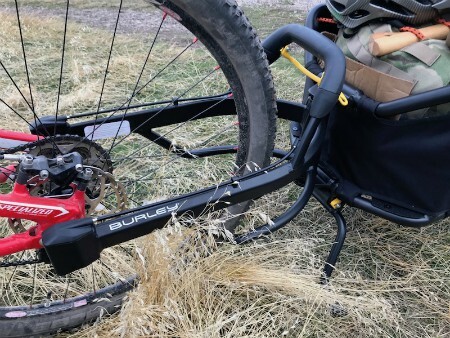 Some of the major accomplishments of the Burley COHO XC bike trailer include an adjustable width yoke that fits up to 29-inch tall wheels and three-inch wide tires. Although the Burley COHO XC bike trailer requires a dedicated axel, there are enough choices to fit most bikes, and the variable-width yoke keeps the COHO XC engaged in the bug out across almost all realistic bike frames. 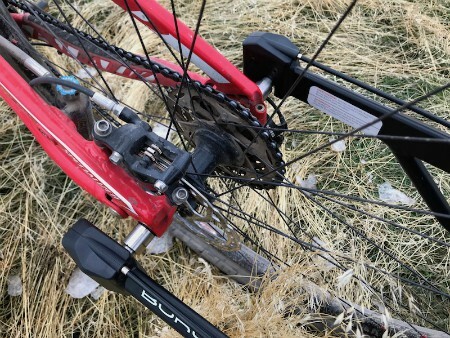 The COHO XC uses a wonderfully simple hitch mechanism. At the edges of the replacement axle are two spherical knobs that seat into matching cups on the trailer’s yoke. The curved nature of the knobs allows a spring-loaded capture/release catch to lock the ball into the cup. In the center-top of the yoke’s handle is a lever that operates the catch mechanism. Because the lever and handle are integrated, it is both easy and fast to release the COHO XC from the axel and move it where you want. Unlike other designs that requires individual-side axle release and small-part manipulation (and risk of part loss), the COHO XC truly is a fine piece of high-speed-low-drag bug out kit. Furthering the low-drag theme is the essentially tool-free design of the COHO XC. 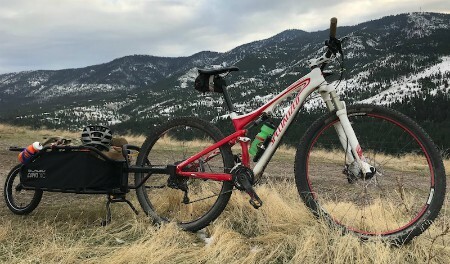 The yoke is attached to the frame with a long quick-release skewer, and the over-sized rear fender mounts into frame tubes and is secured with cotter pins. As expected, the single wheel is locked into the fork with a traditional axle quick release skewer. The COHO XC consists of a metal frame with durable nylon fabric completing the basket. A rigid fender accepts additional panniers (saddlebags), and throughout the frame are attachment points pre-drilled, threaded, and spaced for water bottle cages or any other attachment of similar bolt spacing. Another feature of the frame is that the top rails are level meaning an odd or over-sized shaped load can be strapped to the frame without it pointing towards the ground. With all the packing goodness of the COHO XC it will be easy to forget the recommended 70 pound carrying capacity. A key element of the COHO XC is the integrated kickstand. The spring loaded stand resembles an upside down set of old-school BMX bike handlebars, but the new-school advantage here is that the adjustable height kickstand not only folds away automatically when you start riding, but also is strong enough to support both the COHO XC and your bike keeping them upright assuming roughly level terrain. 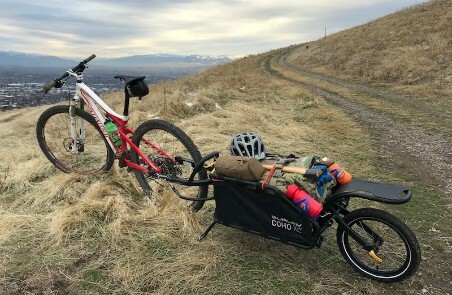 The real test of the COHO XC was a fiery ride down a winding single track with all 70 liters of cargo space filled with bug out gear. On its own, the COHO XC performed splendidly. And compared to other past trailer designs, the COHO XC demonstrated what is possible when design evolution is set free to do its job. The Burley COHO XC and I took a few three mile descents over varied terrain and hairpin turns. Even through mud and dropoffs, the COHO XC performed flawlessly. During the first run, I noticed the quick release attaching the yoke to the frame had loosened, but adding a little more tightness, it never loosened up again. The effortlessness of the hitch mechanism seems to be something I should worry about, but only because it is so easy to operate. But too easy? In studying the design, I found the only real concern is that water could enter the cable housing that runs from yellow release handle on the yoke to the spring-loaded detents in the sockets where the axle balls fit. This would accelerate a RTTPOFS or rust-to-the-point-of-failure scenario. However, if the cable broke, I could easily disengage the detents and release the trailer manually by simply reaching into the sockets and depressing the detents with my finger. In a true SHTF, you could easily work around the ball-and-socket mechanism to the point of permanently securing the trailer to the axle, or building a simple but effective work-around to allow on-demand hitch and release of the trailer. The handling of the loaded COHO XC requires a small adjustment in your riding habits. Due to the additional length, weight and potential sideways pull of the loaded trailer, the flow of the turn must account for the entire bike-trailer system. If the bike is turned too quickly, the trailer will add a Newtonian Law lateral tug on the bike requiring a course correction and balance adjustment. But when the bike and trailer are driven in unison, the entire system flows through turns and terrain like a champ. And when going downhill, you might even forget it’s there. Related: How Familiar are You With Emergency Exits? A key element of the single-wheel trailer compared to the more traditional dual-wheel trailer is that the articulated nature of a triple-wheel inline system (bike wheels followed directly by trailer wheel) provides multiple pivot points where road bumps and trail undulations are soaked up with a rocking motion rather than the aggressive ram-and-bounce approach of the dual wheel designs. The reason this articulation works is that as trail bumps and dips lift or lower the angle of the trailer while two-wheel designs raise and lower the entire trailer at once making for a much harsher ride and also a trailer than can easily get hung up on logs and curbs. Even more, the width of the COHO XC fits within the width profile of the bike’s handlebars meaning you can zip through with trailer any opening or pathway you could have ridden through anyway. Not always true with dual-wheeled trailers, especially when turning. Even if you do encounter an edge, the wedge shape of the COHO XC as it extends off the bike will just force itself into alignment with the bike. 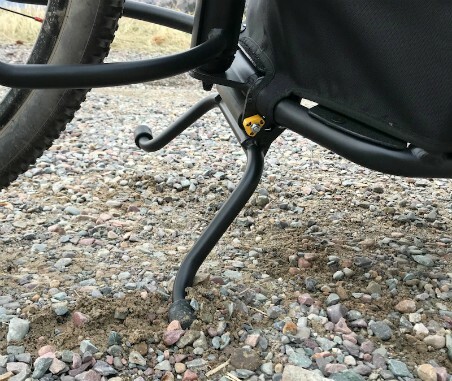 And with a single-wheel design, there is no way you can hook a trailer wheel on an obstacle, tree, branch, fence post, or any other object small enough to fit between side wheel and frame and strong enough to destroy your trailer or throw you over the handlebars, or likely both. Furthering the smooth ride of the COHO XC is a spring shock mounted between the frame and the rear wheel fork. The adjustable spring soaks up bumps and vibrations, and keeps the wheel on the ground as much as possible. Trailers are notorious for briefly leaving the ground when encountering bumps of a certain size. This phenomenon can cause the trailer to bounce sideways, and even hop off the side of a trail on its own. With a bit if spring actuated float, the trailer tire will grip the ground better under lateral forces over bumps and washboarded roads. For the bug out, there is one feature that will likely not get used and that is the orange safety flag that rides atop a flexible pole. However, one flag component that will likely get some use is the bottle opener integrated into the flagpole mount. The value of any particular piece of survival gear is based on its overall contribution to the survival equation with bonus points added for gear you can use now for fun and work. A $40k dedicated bug out vehicle that sits in your garage is an effective and desirable piece of kit, but perhaps not the most immediately functional. So for one 100th that price, you can have the next best thing, the Burley COHO XC bug out bike trailer. A Deep Well Pump Jack: Vital Part of Water System, by R.M.